Paperback, 8.3 x 11.7 in. / 100 pgs / 100 color. 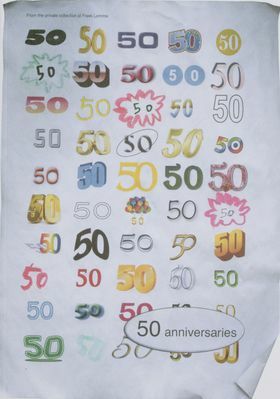 This publication and exhibition explore the typically Dutch tradition of publicly displaying homemade photo collages throughout streets and neighborhoods in celebration of a person's 50th birthday. Almost reminiscent of missing pet posters, amateur portrait photographs are distributed and displayed by being taped onto lamp posts and stapled to trees by friends or relatives, at the mercy of public opinion. Exposed to judgment and ridicule by friends, family, and strangers, due to the usually demeaning nature of the photographs through unflattering holiday photos and the likes, individuals are exposed, raised out of anonymity and placed in the public eye.To an extent the street becomes an exhibition space for the non art-oriented person. It's a document of the democratization of the public domain, through a tradition which allows artistic expression and experimentation for anyone, under the gaze of a watchful even if disengaged audience. The presented collection of posters, possibly a study of non-intentional art under the scrutiny of the public eye, constitutes an archive and an ode to amateur, homemade graphic design, made possible through the democratization of artistic means and software such as word art, paint, and clip art. A non-hierarchical demonstration of taste and aesthetic is catapulted into the streets and now gathered in the exhibition space. Perhaps involuntarily, the posters bear a sense of humor and irony to the rest of the onlooking public. FORMAT: Pbk, 8.3 x 11.7 in. / 100 pgs / 100 color.